Here’s another ratio problem from @Five_Triangles, this time involving triangle areas bounded by a square. Don’t read further until you’ve tried this for yourself. It’s a fun problem that, at least from my experience, doesn’t end up where or how I thought it would. I see two big challenges here. First, the missing location of point P is especially interesting, but is also likely to be quite vexing for many students. This led me to the first twist I found in the problem: the introduction of multiple variables and a coordinate system. Without some problem-solving experience, I don’t see that as an intuitive step for most middle school students. Please don’t interpret this as a knock on this problem, I’m simply agreeing with @Five_Triangle’s assessment that this problem is likely to be challenging for middle school students. The second challenge I found emerged from the introduction the coordinate system: an underlying 2×2 system of equations. There are multiple ways to tackle a solution to a linear system, but this strikes me as yet another high hurdle for younger students. Finally, I’m a bit surprised by my current brain block on multiple approaches for this problem. I suspect I’m blinded here by my algebraic bias in problem solving; surely there are approaches that don’t require this. I’d love to hear any other possibilities. Because I was given properties of point P and not its location, the easiest approach I could see was to position the square on the xy-plane with point B at the origin, along the y-axis, and along the x-axis. That gave my point P coordinates (x,y) for some unknown values of x & y. The helpful part of this orientation is that the x & y coordinates of P are automatically the altitudes of and , respectively. The altitudes of the other two triangles are determined through subtraction. From here, I used the given ratios to establish one equation in terms of x & y. 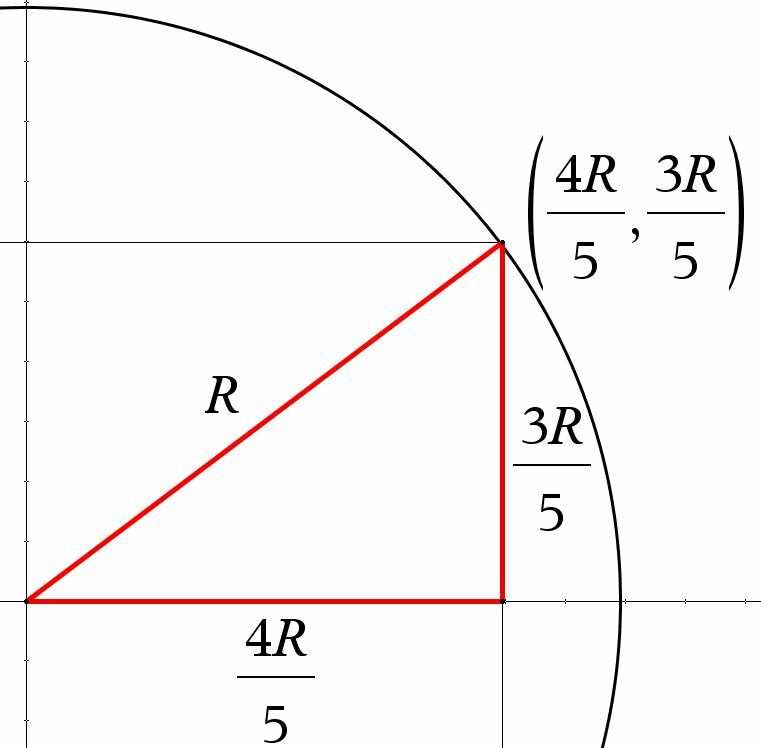 Of course, since all four triangles have the same base lengths, the given area ratios are arithmetically equivalent to corresponding height ratios. I used that to write a second equation. Simplifying terms and clearing denominators leads to and , respectively. A VERY INTERESTING insight at this point is that there is an infinite number of locations within the square at which each ratio is true. Specifically, the ratio is true everywhere along the line 4x=36-3y. This problem constrains us to only the points within the square with vertices (0,0), (12,0), (12,12), and (0,12), but setting that aside, anywhere along the line 4x=36-3y would satisfy the first constraint. The same is true for the second line and constraint. I think it would be very interesting for students to construct this on dynamic geometry software (e.g., GeoGebra or the TI-Nspire) and see the ratio remain constant everywhere along either line even though the triangle areas vary throughout. Together, these lines form a 2×2 system of linear equations with the solution to both ratios being the intersection point of the two lines. There are lots of ways to do this; I wonder how a typical 6th grader would tackle them. Assuming they have the algebraic expertise, I’d have work them by hand and confirm with a CAS. 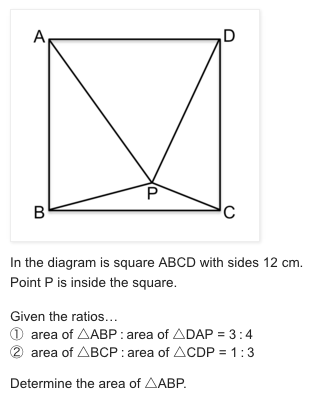 The question asks for the area of . Just two extensions this time. Other suggestions are welcome. 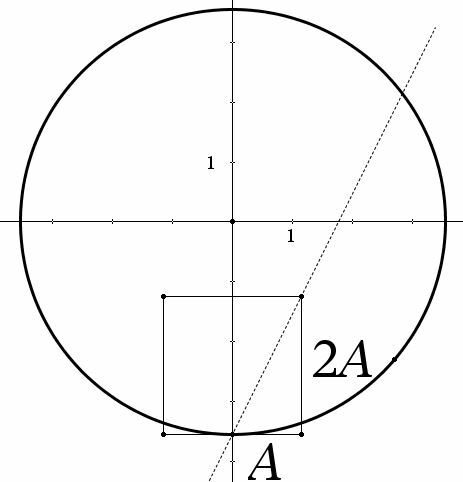 What’s the ratio of the area of at the point P that satisfies both ratios?? It’s not 1:4 as an errant student might think from an errant application of the transitive property to the given ratios. Can you show that it’s actually 1:8? 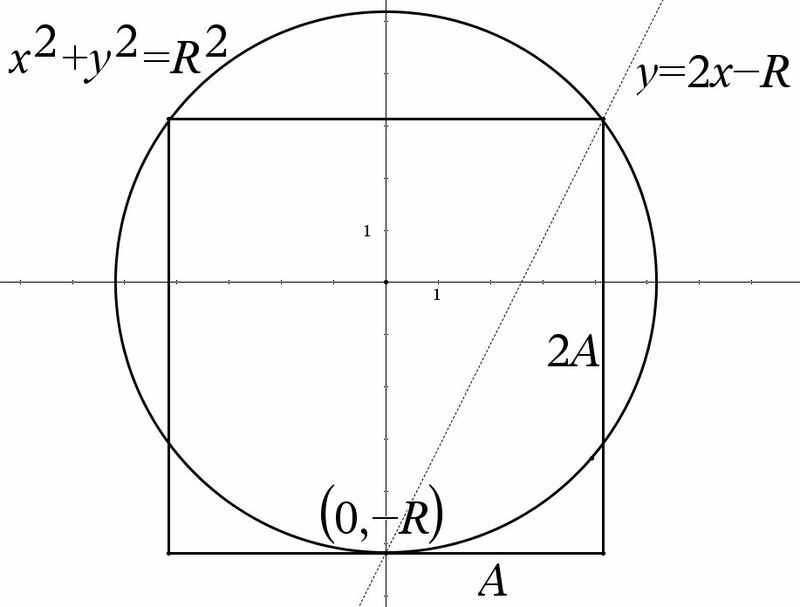 If a random point is chosen within the square, is that point more likely to satisfy the area ratio of or the ratio of ? The first ratio is satisfied by the line 4x=36-3y which intersects the square on the segment between (9,0) and (0,12). At the latter point, both triangles are degenerate with area 0. The second ratio’s line intersects the square between (12,0) and (0,4). 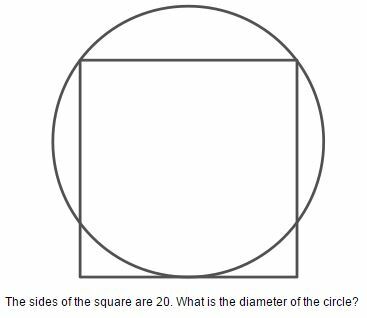 As the first segment is longer (how would a middle schooler prove that? ), it is more likely that a randomly chosen point would satisfy the ratio. This would be a challenging probability problem, methinks. What other possibilities do you see either for a solution to the original problem or an extension? I’m teaching Algebra 2 this summer for my school. In a recent test on quadratic functions, I gave a question I thought would be a little different, but still reachable for those willing to make connections or exert a little creativity. 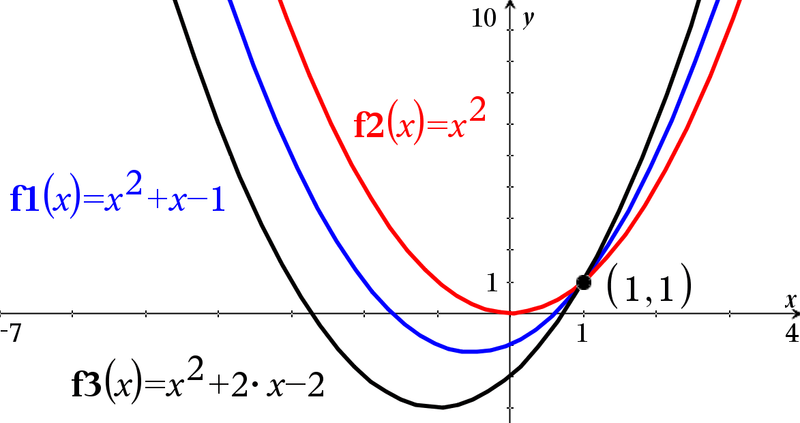 Write a system of quadratic functions that has exactly one solution: (1,1). Their handheld graphing calculators were allowed. Some students definitely had difficulty with the challenge, some gave a version of the answer I expected, and one adopted a form I knew was possible, but doubted anyone would actually find during a test situation. I show my students’ solutions below. But before you read on, can you give your own solution? SOLUTION ALERT! Don’t read further if you want to find your own solution. We’ve had many discussions in class about the power of the Rule of 4–that math ideas can be expressed numerically, graphically, algebraically, and verbally. When you get stumped in one representation, being able to shift to a different form is often helpful. That could mean a different algebraic representation, or a different Rule of 4 representation altogether. A graphical representation verifies the solution. Another student recognized that if two parabolas shared a vertex, but had different “slopes”, their only possible point of intersection was exactly the one the question required. Here’s a graphical version of her answer. Another way to solve this question makes use of the geometry of quadratic graphs. 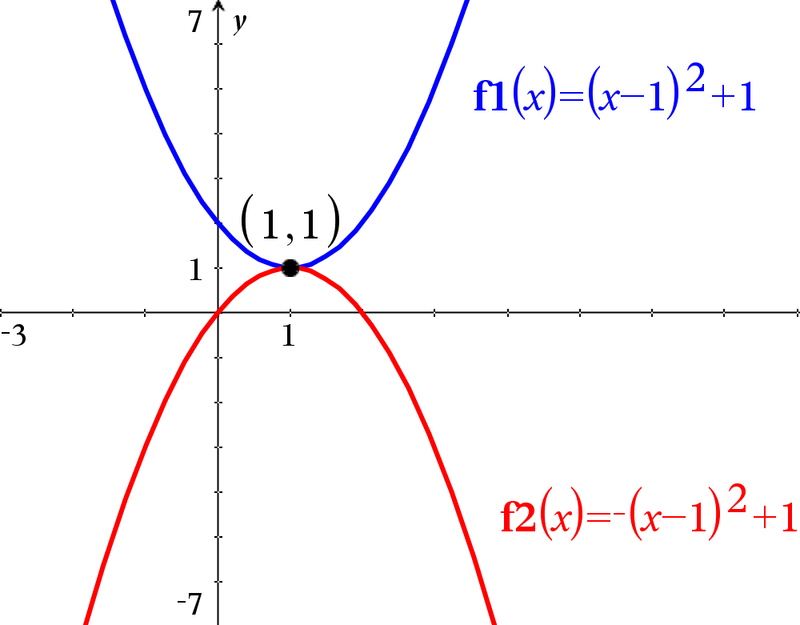 If two quadratics have the same leading coefficients, they are the same graph, intersect exactly once, or never intersect. This is a very non-trivial idea for most students. While I’m not convinced the author of the following solution had this in mind when he answered the question, his solution works because of that fact. Here’s what J wrote on last week’s test and its graph. J used more equations than he needed, but had he restricted himself to just two equations, I’m not sure the lovely pattern would have been so obvious. This is a very different (and super cool) answer than what I expected my students to produce. Lesson re-learned: Challenge your students, give them room to express creativity and individuality, and be prepared to be amazed by them. J’s answer actually opens the door to other avenues of exploration. Can you generalize the form of all of J’s equations, essentially defining a family of quadratics? Can you prove that all members of your generalization satisfy the question posed and that no other answers are possible? 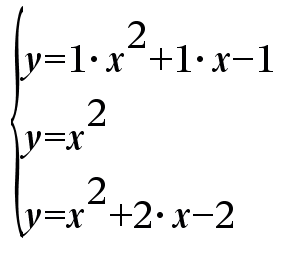 Can you find forms of other generalized families of quadratic functions whose only solution is (1,1)? Notice that there were two types of solutions above: A) those with coincident vertices and different lead coefficients and B) those with identical lead coefficients and different vertices. Are these the only types of quadratics that can answer this question? That is, is there a system of quadratics with (1,1) as the only solution that have identical vertices and lead coefficients? Could both be different and (1,1) be the only solution? For my part, I’m returning to some of these questions this week to stretch and explore my student’s creativity and problem-solving. I’d love to hear what you or your students discover. Here’s an interesting variation of a typical (MS) problem I found by following the Five Triangles ‘blog: http://fivetriangles.blogspot.com/2013/09/97-no-triangle.html . I know this question can absolutely be solved without using technology, but when a colleague asked if it was appropriate to use technology here (my school is one-to-one with tablet laptops), I thought it would be cool to share with her the ease and power of Desmos. You can enter the equations from the problem exactly as given (no need to solve for y), or you can set up a graph in advance for your students and email them a direct link to an already-started problem. If you follow this link, you can see how I used a slider (a crazy-simple addition on Desmos) to help students discover the missing value of a.
I suggest in this case that playing with this problem graphically would grant insight for many students into the critical role (for this problem) of the intersection point of the two explicitly defined lines. With or without technology support, you could then lead your students to determine the coordinates of that intersection point and thereby the value of a. 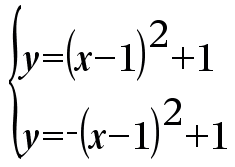 Substituting the now known values of x and y into the last equation in the problem gives the desired value of a. NOTE: I could have done the sliders in GeoGebra, too, but I wanted to show off the ease of my two favorite (and free!) online math tools. Thoughts? What other ideas or problems could be enhanced by a properly balanced use of technology? As an extension to this particular problem, I’m now wondering about the area of triangle formed for any value of a. I haven’t played with it yet, but it looks potentially interesting. I see both tech and non-tech ways to approach it.